We’re happy to announce that Chartbeat is now providing real-time analytics to Six Apart’s TypePad blogging service and major webhosting service DreamHost! From now on TypePad bloggers will be able to access Chartbeat for just $6.95/mo after their free trial, a saving of 30%. 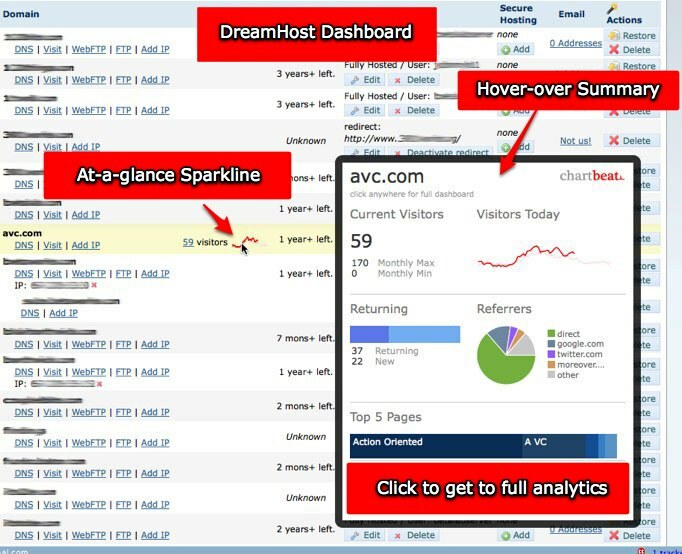 DreamHost have gone even further and have integrated Chartbeat analytics into the heart of their service. You will be able to see how many people are on your site, where they came from and what content they are engaging with directly within DreamHost and then be able to click through to your chartbeat account for the full picture. We’re really excited about partnering with two such wonderful companies and we’re looking forward to seeing just what we can do with them. As you may have read, Google Analytics recently beta-launched asynchronous tracking – an enhancement that we also made to Chartbeat back in October. The main reason for our switch (as well as Google’s) was to minimize the impact that our code has on your site’s load time. So, what are your thoughts on Google’s switch to asynchronous tracking? Have you already installed the updated script? If so, have you seen a noticeable difference in site speed? Leave a comment or message us on Twitter (@chartbeat) with your thoughts.